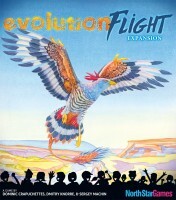 Evolution Flight is an expansion for the Evolution game system that introduces avian species into the ecosystem. Now your species can swoop on unsuspecting prey from above, fly away from predators, or soar to a new location when food is scarce. Will the ability to fly propel you to new heights? Or will it bring your downfall? Explore the expanding world of Evolution and find out! Add a Review for "Evolution: Flight"